A native of the Hoosier State, Larry is alive today because of the kindness of more than 100 strangers. Educated in Indiana and Northern California, he enlisted in the Marine Corps and was shipped overseas to Viet Nam. His enlistment was completed in Okinawa as a liaison noncommissioned officer between USMC and USAF. He received the Viet Nam Campaign Ribbon and Good Conduct Medal prior to being honorably discharged. Larry completed his general education for an A.A. Degree at Contra Costa Junior College and in the fall of 1971, he enrolled in the Oakland Police Academy. As a “Rookie” he was awarded the Department’s Medal of Merit for attempting to save the life of a drowning victim. In the next 12 years, he distinguished himself as a member of the S.W.A.T. Team, Solo Motorcycles, Hit & Run- Follow-up Accident Investigator, Field Training Officer, Background Investigator, Police Olympics Departmental Coordinator, and a Board member of the Oakland Police Officers Association. For this service he was awarded the Association’s Distinguished Service Award. 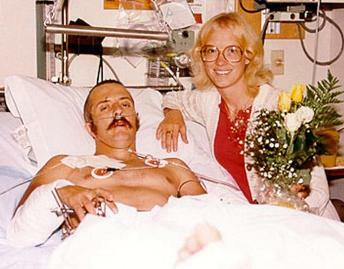 While on duty, August 21, 1982, Larry was permanently disabled by a traffic accident. A DUI driver, speeding at 65 MPH, struck him as he was speaking to a stopped motorist. The outcome was a need for 110 units of blood and nine major surgeries to repair extensive injuries, plus mandatory retirement. 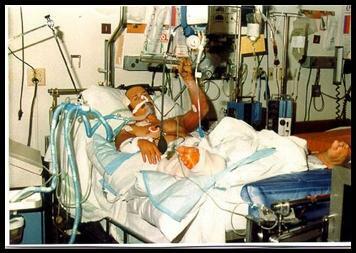 He refused to let personal tragedy keep him down after his near-fatal traffic accident. Following his surgeries, extensive rehabilitation, and physical therapy, he came to Sonoma State University in spring of 1985 as a part of the vocational rehabilitation program offered through his employer. He chose to focus his studies on Management with a special emphasis in Marketing and received his B.A. in 1988. While working with non-profits such as Easter Seals and the California Blood Centers he became an ardent blood awareness advocate and his mission in life became evident as he began to touch and inspire people with his message of courage, hope and personal triumph. He credits his success at Sonoma State University to his belief in God and Jesus Christ and many inspirational professors, foreign exchange students and staff he encountered daily. Especially Jan Parks in the Disability Resource Center and George Johnson, of the Business Administration Department. Of them he says, “these two individuals touched and inspired me through their selfless help and constant encouragement”. December 1992, October 1993, and August 1994 brought three annual “Miracle Rides”, one day 75 mile bike trips in Sonoma County which thanked his donors and raised more than $5000 annually for the local Easter Seal Society of the Redwood Coast. June 1995 brought the “Ability Across California”, a 1000 mile bike trek in 10 days to unite communities on behalf of those in need of emergency blood supplies and dedicated to the police officers who died in the line of duty. (The program resulted in a 15-20% increase in donations to participating California Blood Centers). June 1996 saw the advent of “Life Across America”, a nationwide blood drive with Larry and his son riding 4,266 miles for the cause. The ride culminated in Washington D.C. in the Oval Office at the White House, with 191 blood drives gathering 75,000 units, resulting in the American Association of Blood Banks awarding him, The President’s Award. Larry and Aaron at the completion of the ride. 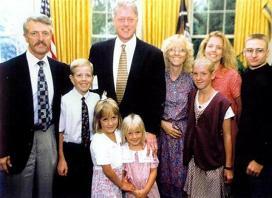 The family meets with President Clinton. June 1997 brought another nation-wide blood drive “Five Points of Life” with Larry riding 2800 miles with the twelve LifeSouth team members which finished in Gainesville, Florida, resulting in raising another 6,340 units of blood/apheresis donations and more than 7,557 bone marrow/organ donor registrants. February 1998 brought the first perpetual “Larry Frederick Award” awarded by America’s Blood Centers recognizing an individual for his/her contribution to the independent volunteer blood community. October 1998 brought the “Distinguished Alumni Award” from Sonoma State University, it is the highest honor awarded to their alumni. It is designed to recognize individuals for outstanding achievement and contribution both to the community and to society at large. June 2008 brought the “Life Across America 2008”, a nationwide blood drive with Larry riding 3,255 miles in 50 days across the northern states and Canada, raising 1000+ units of blood. 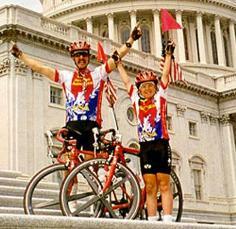 June 2010 brought “Life Across America 2010” in which Larry and his daughter, Adella, rode together 3,850 miles in 52 days to promote the need for blood donations and to thank the blood donors through the U.S., Canada and the world. Larry also served on the Blood Bank of the Redwoods Board of Directors in Santa Rosa CA from 1998 to 2003. At the invitation of America’s Blood Centers, from 1998 – 2011, Larry has been the presenter of the “Larry Frederick Award”, given to a worthy recipient(s) at ABC’s Annual Awards Dinner. He is currently retired, enjoying his grandchildren, and is a past board member of the Blood Bank of the Redwoods of Sonoma County in Santa Rosa, CA. When invited by ABC he presents the Larry Frederick Award to a deserving individual. He continues to lecture as a compelling and inspiring speaker, (as a blood recipient), speaking on the behalf of blood awareness, the constant need for blood donations, and a safe blood supply for the blood centers of America.